As an avid landscape photographer who spends as much time as work/family life allows in the field, I occasionally experience moments of true connection with the landscape. These are special periods of time which have a lasting effect in my mind. The images I create during these moments tend to have more lasting & sentimental value to me. What does the term “True Connection” even mean? We hear so many professional photographers talk about their connection to nature and the landscape. It probably means something different to each of us if truth be told. I will struggle to articulate this concept. I can only describe it as “feeling and being touched by the elements” at a given moment in time. This can be as simple as feeling the glow of a sunrise on your face, or the old cliché of the wind in your hair, etc etc. Undoubtedly, the reader probably won’t truly comprehend until they have truly experienced this first hand. I recently had an hour to spare between meetings on the west coast. I wasn’t far from Dun Briste Head. 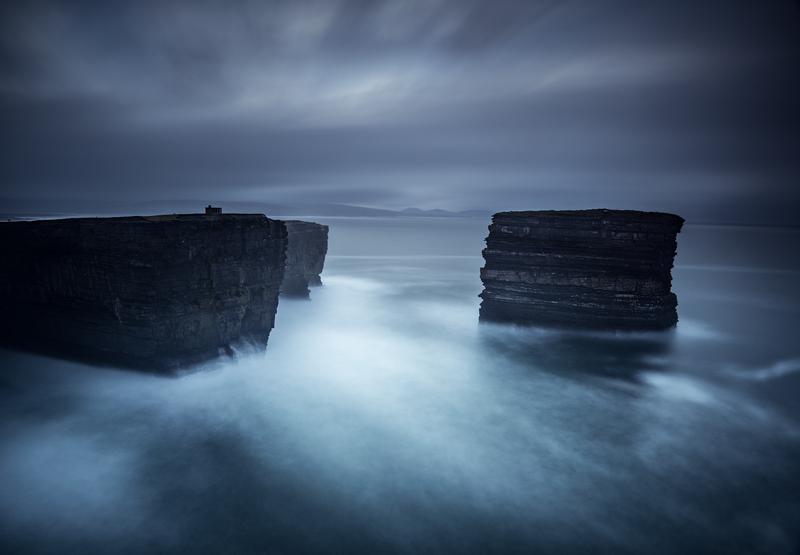 This is a relatively remote location with epic 50 metre high cliffs and a huge sea stack. Beneath the cliffs are huge sea caves which have been formed due to the constant pounding of the Atlantic waves. As I arrived, conditions started to brighten up. 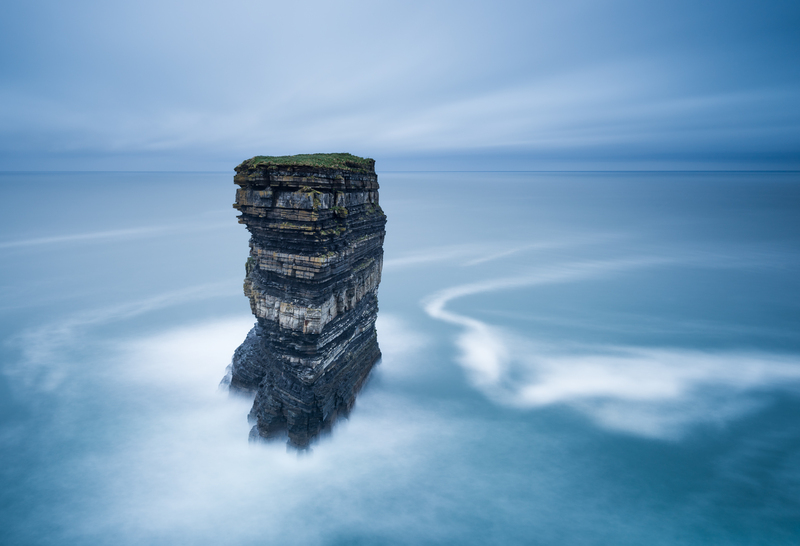 I managed to capture the obligatory long exposure image of the isolated sea stack and was quite pleased with myself having gambled on the weather. It’s not the most unique image in the world but it is a high quality saleable version of what so many have done before me. Had it ended there, I’d have left happy. I took a walk around to explore a little more – conditions were starting to deteriorate again and quickly. The wind picked up, clouds got darker and before long it was raining again. At this point I had walked as far out as I could on an adjoining cliff face. Looking back towards where I had originally stood. This gave a completely different perspective to the location and helped give a sense of scale to the sheer size of the cliffs. I stood there in the rain and isolation soaking up the atmosphere of the location as ever increasingly massive waves pummelled the cliffs below me. All I could hear were the waves crashing and the cries of seagulls who clung to the rocks for shelter as the light faded. I’d not seen sight of another person in the hour or so I was there. A feeling of loneliness and isolation crept over me. My only companion was the small WW2 lookout hut which has stood there alone at the top of the cliff as it has done since the early 1940’s. It looks towards the vast Atlantic as the waves constantly channel caves below it. I got to thinking which will take it first, sea erosion or the corrosive effect of the elements & time. I bet it is the later. Either way, I reckon it will still be stood watching into nothingness long after I am gone. This is when I realized that sense of “True Connection” with the landscape has taking me over. I knew the image I needed to create, not one to sell or show, but one for me. An image that could convey exactly what I was feeling and thinking as I stood there. An emotional, powerful image that in my opinion will stand the test of time. Not happy, pretty feelings but powerful feelings none the less. Now for the hard part – transferring that connection to the landscape into a 2D image that conveys your mood. I won’t lie, I struggled greatly with the composition not knowing whether to give more weight and emphasis to the sky or water. Should I shoot letterbox format in order to eliminate my dilemma? Either way, I knew the end result would be a dark natured long exposure creation. I initially envisioned it in black & white but instantly knew I wanted to keep the cold blueish hue created by my big stopper filter once it appeared on the back of my camera. The blue colour cast helped deepen that sense of the forlorn loneliness I felt at the time. I hope what I have described comes across in the image – it is an attempt to convey an emotional landscape inspired by a connection with the elements experienced at the time. I would pick an image like this every time over a conventional mainstream shiny sunrise or sunset landscape with an abundance of saturated colour. It is a personal choice. Images oozing mood and character are much harder to find in my opinion.